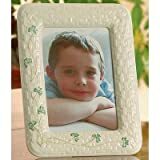 If you're shopping online for the perfect Irish photograph frame, here's a great collection of Belleek picture frames in a variety of styles and sizes. Romantics will love the claddagh design. Those looking for a rainbow of luck will love the shamrock design and traditionalists will love the Tara design. Whichever you choose to purchase, you can rely on the Belleek name for quality and craftsmanship. Belleek porcelain is manufactured in County Fermanagh, Northern Ireland. The company, started in 1857, has a long tradition of exquisite porcelain design. The brand is known throughout the world and is easily recognized. When you give a Belleek gift, your gift recipient will know that you'll given them a high-quality, keepsake gift. Picture frames showcase our most important memories - as we share them with the world throughout our home and even on our desks at work. 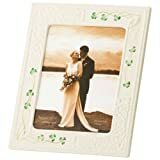 If you are of Irish heritage or just love the Irish philosophy toward life, then you might want to add some Irish Belleek picture frames to your home decor. Belleek is a world-renown and iconic Irish brand. It's muted white patterns with shamrocks and other Irish symbols make it perfect for a baby nursery. But it's also very much an adult pattern as well. 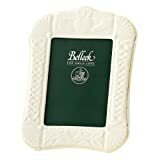 So a Belleek picture frame will easily move from a nursery decor to a more grown-up design as the baby grows into an adult. It is destined to become a keepsake gift. 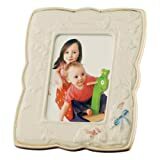 Belleek china gifts and picture frames are definitely keepsake gifts that become family heirlooms. 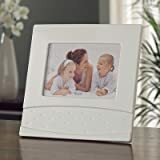 When you choose such a high-quality and distinctive picture frame for a baby picture or special birthday, you're telling the whole world just how important that moment was to you. Irish claddagh wedding rings have become very popular in recent years. I notice many couples have chosen them for "pre-engagement" rings as well as wedding rings. If close friends of yours have made the claddagh a symbol of their love and loyalty, then by all means give them a picture of themselves in a Belleek claddagh frame. I think that an oval picture frame is the most feminine of all. 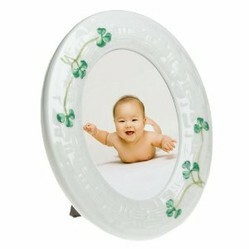 If you want to give a woman or girl of any age a keepsake picture frame, I'd recommend an oval-shaped Belleek frame. In addition to the shape, Belleek has a soft color palatte that will compliment any woman's vanity or office desk. I guarantee that it and the picture it holds will bring a smile to her face every time she looks at it. My husband took a Belleek picture frame and put a beautiful picture of Dublin in it. No we've never been to Dublin, but we are saving up to go there. Hopefully we'll make it for our 10th anniversary. But I've got to tell you on our worst days when nothing is going right, whenever I spy that picture frame I remember that better days are ahead of us. Yes, Belleek china does cost a bit more. So I admit that I don't give it as a gift to just anyone. But when I want to give my sisters or special friends a special gift to commemorate a special moment, I want them to have a high-quality keepsake gift. The Belleek frame to the right is one of my all-time favorites. I love the delicated painted shamrocks in two opposite corners and the white on white hearts in the other two. This makes it perfect for a wedding gift, engagement gift or even a housewarming gift. Anytime you want to express love and luck or prosperity in the same gift. 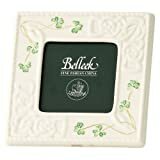 Belleek B3006 Tara 3- by 5-Inch Viewa... TARA shamrock clover Irish porcelain ... Belleek Champagne Frame, 5" x 7"
Belleek Eclipse Frame, 5" x 7"
For people who love the quality of Belleek, but don't want shamrock designs, there's the Belleek Eclipse pattern. It features soft, arcing lines that frame the photography subject perfectly. 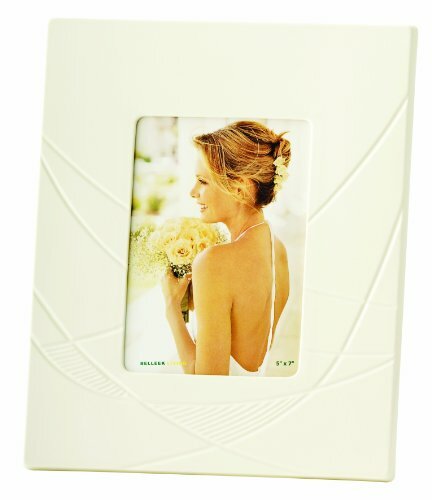 The lines have an organic quality to them, so they'll blend perfectly with other Belleek frames if that's a concern. However, they do look stunning on their own. The top of the design is open and the bottom has a denser feel, because of the diagonal lines that fill one of the areas. People who love the Arts and Crafts movement or mid-Century design will love this Belleek picture frame. It measures 5 inches x 7 inches and fits perfectly on a fireplace mantle, bedside table or sofa end table. Everyone recognizes the Belleek name and will know that you certainly treasure these memories. An inspirational assortment of items such as wall plagues, wall crosses, and sun catchers with Irish Blessings.